Fancy a beach vacation? Sitting on the sand, dipping your toes in the pristine waters of an undefiled beach that resembles something from a tropical prehistory. Sipping a light cocktail while on the water, waiting for the little fish to bite. That’s what the ocean is, after all, right? Wrong! What we see near the coast— the surface of the sea— is a millimetric fraction of all the incredible, astounding majesty of the oceans of our world. And I’m not even just talking about space— the ‘time factor’ is huge, too! Life got started in the water and, through the ages, the waves and deep places have seen lots of awesome (and frankly terrifying) stuff. So it really isn’t surprising that we, tiny humans that we are, invented countless stories and legends to explain what, compared to us, is enormous and tremendously mysterious! As a result, mythologies all around the world are full of tales of awe-inspiring sea monsters. Sometimes they’re kinda funny but, at other times, they are downright bone-chilling. Over time many cultures and countries developed stories of deep sea creatures. So we have compiled our list of the 10 weirdest sea monsters from mythology. Want to meet them? Remember Peter Jackson’s The Fellowship of the Ring? Spoiler alert: right before the merry group of bedraggled travellers heads into the trap of once-stunning Moria (of ‘this isn’t a mine— it’s a tomb!’ fame), they get attacked by the creepiest guardian dog ever. This creature, called The Watcher in the Water, is some sort of weird, aggressive octopus that inhabits the stagnant pool right outside the mine and is intent on catching (and munching on!) anyone who tries to trespass. Talk about paranoia, owners of Moria. Next time you’re on a boat near the Antarctic, look out for the Ningen. How to spot it? You’ll notice its eerie bleached-white skin, humanoid shape (five-fingered hands included), and Voldemort-style zero nose. Oh, and the length? 20 to 30 meters. Sailors in Japanese ‘whale research’ operations first spotted the Ningen in the 1960’s. It typically behaves by swimming, by night, to the surface to absolutely terrorize you. A bit more vicious than the terrifying (but mostly exhibitionistic) Ningen, the Finnish sea monster Iku-Turso is a cross of a giant, nasty tempered octopus and a winged dragon. I guess it can fly as well as swim, but sure do hope I won’t find out. The hot piece of real estate this bearded monster inhabits is called Pohjola, aka ‘The home of all evil’, at the bottom of the sea. Fittingly, Finnish mythology accuses the Iku-Turso of being the father of all diseases. Freud said that what we find the most sinister is not what’s completely different from us, but that which is similar to ourselves with an unsettling, odd twist. It makes sense, then, for the Inuit mythology monster Qalupalik to be the stuff of nightmares! This sea creature is, essentially, an evil mermaid. Mostly a human, with green skin, and fingernails like daggers, the Qalupalik lurks near the shore. There, it emerges and hums (yes, hums) until a child goes find out what’s going on. Then it eats the child. Yuck. If you see an especially muscular horse galloping on the beach and you get a sudden urge to ride off into the sunset like a Western version of Baywatch, you might want to think again. Especially if you’re in Scotland. The Scottish Each Uisge is a pretty evil horse, as far as horses go: it’ll subtly charm you into getting on its back and, once you touch it, it’ll make your skin stick to its body. Then, it’ll violently race and dive into the water, causing your body to get torn so it can, eventually, eat you. It’ll leave your liver alone, though. No worries. A master of disguise, this enormous sea monster of Celtic folklore actually looks like a serpent. However, it uses a most cunning technique to hunt: the Cirein Croin shrinks down into the body of a regular fish so a fisherman will catch it. Once it’s out of the water and on the boat, it transforms back into the original, huge serpent body and swallows the fisherman, boat and all. It can even eat a couple whole whales at once, no problem. Some think the Cirein Croin is actually an ancient memory of a sea dinosaur. Every lover of the creepy and the ocean must read H.P. Lovecraft’s The Call of Cthulhu for maximum shivers. Though no one can look at Cthulhu, The Great Old One, without going absolutely bonkers, we know it looks a tad like an octopus-human-dragon hybrid. Its hobbies? Sleeping in the South Pacific and getting worshipped by human cultists. In an incomprehensible language. With the goal of waking it up. No, thanks. Of biblical fame, the Leviathan is a sea monster spawned from Jewish mythology— a kind of fully evil primordial serpent of absolute chaos. It is fire and water: the Leviathan’s presence makes the water boil and bubble up uncontrollably, which causes the savage death of everyone nearby. If you feel the water heating up, get out of there, double quick! One and many, this Greek monster is the guardian of the World of the Dead. Now, you probably don’t want to get there in the first place but, in case your quest takes you there, be warned! The Hydra has one body but many long serpent necks and heads decked out with sharp teeth and venomous breath. The catch? Heroes often meet their end when facing the Hydra, as cutting one head will only make two grow in its place. The ultimate sea monster, Jörmungandr is the hybrid serpent that, in Norse mythology, encircles the world of men. This creature is huge. So much so that Thor, the strongest of the gods, could only ever manage to lift one of its coils. 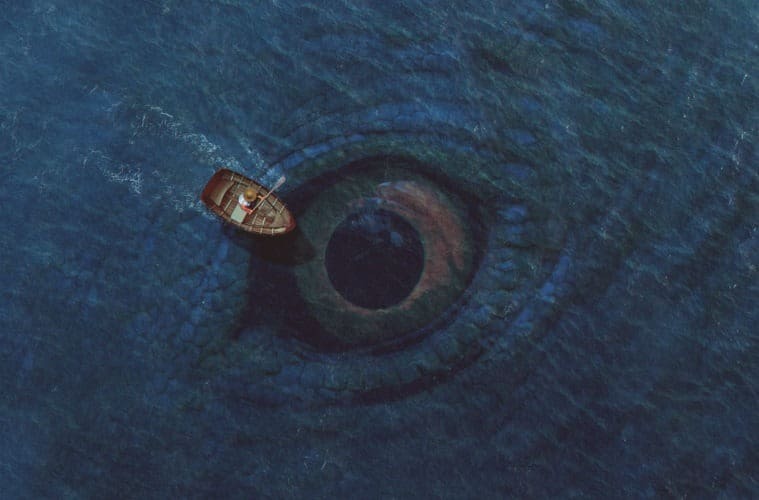 What makes is more terrifying than all other sea monsters? Well, we know that, when it eventually shows itself on the surface, Ragnarok (the final battle of the gods) will cause the world to end! The sea, its mystery, and its many creatures have spawned the oddest, most petrifying stories. So, if you’re going to the beach anytime soon, keep an eye (and your phone’s camera) out— you might be the next to spot them!